A new study from Market Force Information about the U.S. grocery industry shows significant churn for meal-kit delivery services where all the needed ingredients and recipes are shipped directly to homes. In general, the survey shows continued growth in popularity for meal-kit brands, with 15 percent of the study participants saying they’ve tried a meal-kit service at least once, which is up from 11 percent in 2017. However, nearly half (49 percent) were less than satisfied with the experience. 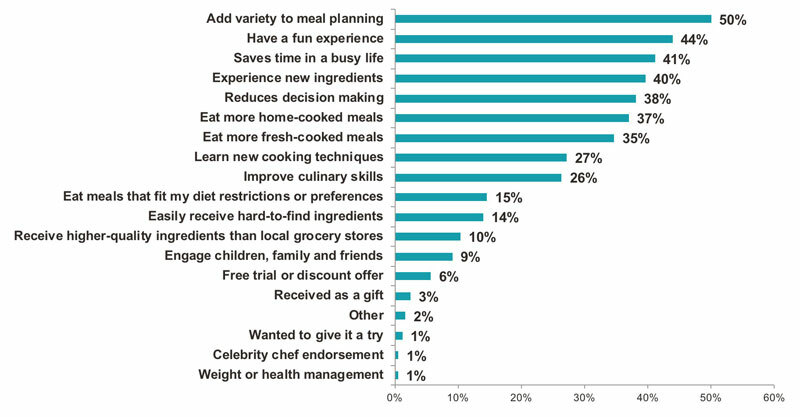 When asked why they opted for a meal delivery service, 50 percent said they were looking to add variety to their meal planning (other popular reasons included a “fun experience,” saving time and sampling new ingredients). Hello Fresh overtook Blue Apron as the most popular meal kit service, with 39 percent indicating they’ve tried it. Blue Apron fell to second with 35 percent, and Home Chef was a distant third with 9 percent. However, 83 percent who tried a meal delivery service have stopped using it (up from 76 percent in 2017), primarily because of poor value, but also due to portion size and cost. Home Chef had the highest satisfaction rating and the lowest customer churn, along with Plated. About 22 percent of the consumers surveyed said they’ve used such services, up from 18 percent in 2017. Most (35 percent) are using the service to order from online grocery retailers such as Peapod and Shipt, 34 percent through general online retailers such as Amazon and Jet, and 24 percent ordering from a grocery store chain. One-fifth of the respondents said they were less than satisfied with the experience, suggesting ample room for improvement.